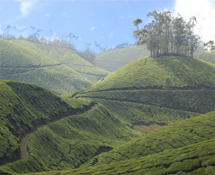 Munnar is a beautiful hill station covered with unending expanse of tea plantation..This was once the summer resort of the British Government in South India. Panoramic views of low-flying clouds and mist filled valleys make it a pretty little heaven with a cool bracing climate. It was opened up out of virgin forests a century ago by pioneering planters.Thekkady, better known as Tiger Reserve is a rich diversity of vertebrates. The diverse forest types, vayals, marshes, and a large aquatic habitat together support 62 species of mammals, 320 species of birds, 45 species of reptiles, 27 species of amphibians, and 38 species of fishes . The Nelliyampathy hills, just 75 km from Palakkad, are situated at a height of around 467 meters with the highest peak, Padagiri, at 1572 meters. These hills comprise a chain of ridges cut off by valleys of dense, evergreen forests and orange plantations. To reach this hill station one has to negotiate over a dozen hairpin bends on the Ghat road passing through the jungles of the Sahyadri Ranges. Wayanad, is the most beautiful districts in Kerala.It is a quiet place where scenic beauty, wild life and traditional matter, simplicity is a virtue and beauty still blossoms from the mountainous horizon and from the green glaze of alluring vegetation. Wayanad hills are forming a vast land mass for the wild life to move about in its most natural abode.Now the Land is famous for Black Pepper, Coffee, Tea, Cardamom, Vanila and Ginger. 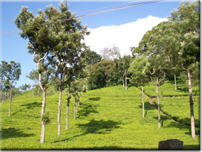 Day 02 - Thekkady-This is a conservation oriented hard trek taking up a full day. The trekking starts at 8 o’ clock in the morning and ends in the evening. Day 02 - Thekkady-This is an interpretive programme offering excellent opportunity to watch birds, butterflies and other wildlife. Day 02 - Thekkady-This is a dawn to dusk range hiking and rafting programme through some of the richest forest tracts of Periyar Tiger Reserve.